We seem to have an “Absent Minded Professor” in the White House. With oil over $100 per barrel, and gas at nearly $3.50 a gallon, our president continues to call for “green energy” to replace our steadily increasing reliance on oil. To my knowledge, cars and trucks have not been retrofitted with windmills or solar panels to power them. Never mind that the wind doesn’t always blow and the sun doesn’t always shine, but until viable options are created to replace oil, we still have an economy where transportation and manufacturing are heavily dependent on the black gold. Yet twice in as many weeks our Professor In Chief has stumped for weaning us of our dependence on oil and increasing reliance on “green” energy. Yet with no viable replacement for oil to transport us, our food, and everything else we buy, he might as well be marketing “flubber,” that fictional “green” energy source created by Disney’s Absent Minded Professor. This month our professor has called for a reduction in U.S. oil imports by 3-4 million barrels of oil a day, or about one-third of our current demand over the next decade. This is to be accomplished not by increasing our own domestic oil production, but by using “alternative and renewable energy sources.” Since there are none on the immediate horizon to replace oil, we are left to surmise that his intention is to incentivize the “flubber” industry to power our Kenworth’s, John Deere’s and Chevy’s. Domestic oil production has declined 40 percent over the past 25 years even though demand has soared. According to the U.S. Energy Information Administration, 75 billion barrels of oil have been precluded from drilling due to political action over that period. That oil would be enough to replace all of our imported oil, excluding what we get from Canada and Mexico, for over 22 years. World oil demand is projected to increase by 40% over the next 22 years, and U.S. demand projected to increase by 28%. While we are unable to control events in the troubled Middle East where much of the world’s oil is drilled, we have the ability to reduce prices and mitigate demand by simply allowing access to our own resources. Our professor also seems to have two sets of teleprompters he employs for his major speeches. When he reads from the one on the right, he brags that his administration has granted more new oil exploratory leases (though the new standards his EPA, Environmental Protection Agency, is imposing for those new leases are so unrealistic that they’re likely to never be exercised). When he reads from the one on the left, he’s promising $2 billion to assist in technology improvements for off-shore drilling. Not here, but in Brazil! His right teleprompter tells him to say, “The only way for America’s energy supply to be truly secure is by permanently reducing our dependence on foreign oil.” But the left one tells him to do everything possible to restrict domestic production. When he reads from the one on the right, he’s advocating the use of “clean coal” and natural gas for our energy needs. When he turns back to the one on the left, he has his Interior Secretary, Ken Salazar, canceling 77 leases for oil and natural gas drilling in Utah. 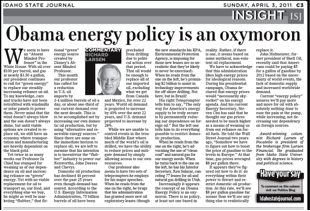 Increasingly it appears the concept of an Obama Energy Policy is an oxymoron. There is no policy, at least not one based in reality. Rather, if there is one, it seems based on some mythical, non-existent oil replacement. We have to acknowledge that this administration likes high energy prices for ideological reasons. During his presidential campaign, Obama declared that energy prices would “necessarily skyrocket” on his energy agenda. And his current Energy Secretary, Steven Chu has said that he thought our gas prices needed to be much higher as a means of weaning us from our reliance on fossil fuels. He told the Wall Street Journal two years ago, “Somehow we have to figure out how to boost the price of gasoline to the levels in Europe.” At that time, gas prices averaged $8 per gallon there. It appears they’ve figured out how to do it: do everything within their power to thwart and restrict domestic oil production. At this rate, we’ll see $8 per gallon gasoline far sooner than we’ll see anything else to realistically replace it. John Hofmeister, former president of Shell Oil, recently said that Americans could be paying $5 for a gallon of gasoline by 2012 based on the uncertainty of world events, the lack of domestic supply and increased worldwide demand. Current “energy policy” assures we’ll pay more and more for oil with absolutely nothing done to ease the pain at the pump, while increasing, not decreasing our dependency on foreign sources.